The rules of solid food introduction into your baby’s diet are not difficult. The most important thing is to understand them and to find the right time for solid food introduction. If you breastfeed your baby and he gains weight well, introduce complementary foods not earlier then after six months. Until that time, your breast milk covers all the needs of the baby. Unfortunately, not all babies are breastfed. If you give your baby formula, you may start feeding him cereal a little earlier. In any case, don’t try to give your baby cereal before 4.5 month, because your baby’s digestive enzymes are not quite ready for new products. The best time to start feeding your baby cereal is at 5 months or later. At this age, your baby is already able to digest carbohydrates, proteins and fats from cereal. If you introduce cereal too early, there is a high risk of bowel problems in the baby. Parents should know that cereals must be introduced after vegetable puree if the baby is overweight or if the weight is normal. Cereals are introduced as first complementary feeding, if the baby’s weight is lower than normal. 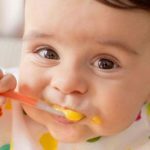 It’s better to begin with vegetables because babies like cereal more, If you start with cereal, the baby won’t like vegetable puree and won’t eat it. What cereal to start with? First porridges should not contain gluten as it is sometimes poorly tolerated by babies. There is no gluten is in rice, buckwheat and maize. Cereals are one of the main sources of carbohydrates, dietary fiber, iron, selenium, vitamins B1, B2, PP and other proteins and fats. Buckwheat is one of the best cereals for babies. It has a large amount of protein, minerals (magnesium, iron, zinc, copper), vitamins B1, B2, PP and dietary fiber. Rice is very rich in dietary fiber. Many parents believe that rice constipates babies. However, in the manufacture of rice flour for baby food, crushed rice is not used, so baby rice cereals do not cause constipation in children. If you make rice at home, it can provoke constipation. Maize has almost the same amount of dietary fiber as rice. However, it has even more protein and iron. Buckwheat -> rice -> maize. Oatmeal has a high nutritional value. It is rich in vegetable protein, minerals (magnesium, calcium, iron, copper, manganese, zinc) and vitamins B1, B2, PP, contains much fat (on average 6 times more than in other cereals).After introduction of these gluten-free cereals, you can try cereal with gluten — oat and wheat. Semolina is not very good for babies. It is not rich in vitamins and minerals. First cereal: with or without milk? Pediatricians advise parents first to introduce cereal without milk, because there is casein protein in milk, which can cause a severe allergic reaction. Cook first cereals in water without salt and sugar. You can add formula or breast milk. If everything is OK, you can add a little milk while cooking porridge for your baby after a couple of weeks. For the first time, don’t give more than 2 tablespoons of milk cereal. Strictly monitor your baby’s response to introduction milk cereals. However, if the cheeks of your baby became red or he has stool violations, delay the introduction of milk cereal for a month. It’s most likely, that your baby’s body hasn’t enough enzymes to digest milk. Try again in a month. If allergic reaction repeats, postpone giving dairy products until 1 year. Start feeding your baby on monocomponent cereal to track his reaction. At 8 — 9 months of age, you can add multicomponent cereals or give your baby porridge with berries or vegetables. To cook or to buy? The first baby cereal should be without milk and without sugar. Do not pay attention to the dates on the package. Many manufactures make cereal for 4-month-old babies. However, it’s better to start feeding your baby cereal not earlier than after five months. You needn’t cook baby cereal. You only need to add warm water, formula or breast milk. Be accurate and strictly follow the instruction on the package. It’s better to make the porridge thinner than thicker. Your baby’s digestive enzymes will not be able to cope with thick porridge and it may cause constipation. Boxed cereals have their downsides. Many manufacturers add sugar, vanilla or fruit juices to them. Certainly, these supplements are harmless, but your baby don’t need them at this age. Boxed cereals can be very sweet and the baby won’t eat other foods after having tasted such cereals. 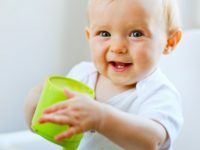 Give your baby cereals with sugar only after 18 months. How to make baby cereal yourself? If you decided to cook cereal yourself, grind the grains in a coffee maker and boil them in water, or cook the grains and then blend them carefully. For the first time, take 5 g cereals and 100 ml water. Add formula or breast milk. Get sure that the porridge has a consistency of yogurt. At 7 months, begin to add a few drops of vegetable oil. At 8 months, you can add a third of a teaspoon of butter. At 8 month, you can add pumpkin or carrot puree to the cereals. After 9 month, try adding berries or fruit, which are non-allergenic. Begin feeding your baby cereal with one teaspoon and watch the reaction. Schedule. How to introduce cereals. Then Add a new type of cereal day by day as above increasing to 200g a day. Also, read this baby feeding chart. When to give baby eggs? How to start giving baby eggs? How much breast milk does a newborn need?